It’s a new year, and with that comes a new and improved you! Last year’s resolutions to eat fewer sweets, increase your savings account, and spend more time with family & friends have been quite successful. There is nothing more satisfying than a hard-earned accomplishment. Whether big or small, an achievement shows dedication, determination, and usually knowledge – because more information is power! So… what is your big resolution for this year? We can only guess (because you are here at DrivrZone), that it involves being more organized while you travel in your vehicle. Most resolutions are individual choices, but when it comes to organization, sometimes it involves a group effort to be successful. While we depend on our vehicles to take us from point A to point B, the duration of our trips vary greatly. From the on the road business person who uses their car as an office, to the all-around super-parent who transports their most precious cargo to daycare, school, sporting events, doctor appointments, tools, etc. We are creatures of habit, and we all know how hard it is to become organized, but it is even harder to remain organized. Likewise, it can be a terrible and frustrating effort when it involves the entire family. It wasn’t that long ago, that I was a busy mom of four little boys. Trust me when I tell you that I literally worked and chased from “son up until son down”. I recall a few very hectic years in particular when my four boys were on three different summer baseball teams, two summer travel ball leagues, two all-star teams, and 2 fall-ball leagues (yep, baseball in 40 degree weather)! The miles and hours we spent in our truck was enormous. I read somewhere once that the average driver spends about 100 minutes per day in their vehicles commuting to/from work, school, appointments, shopping, errands, and you guessed it – baseball games! I assure you we were well above average in minutes per day, as it was actually more like hours per day. So, in the process of writing this review, I’m impressed with what’s on the market; I don’t ever recall all of these awesome options being available for the asking. Knowing what I know now, and had the below trunk organizers been available – my life and the life of my boys could have been so much more organized and my stress level could have been dramatically reduced! At any given time, my vehicle held 6-8 different types of gym bags and equipment bags that flopped around our trunk. Carrying shoes, jerseys, baseball caps, baseball pants, sunflower seeds, bubblegum, water bottles, mouth guards, snacks, baseballs, batting cups, batting gloves, bats, extra clothes, and sweatshirts – times four boys. So, when we were asked by our editor to review and rate trunk organizers, we were eager and thrilled to get started. Who doesn’t need less clutter in their cars, more organized trunks, and a mind more focused on the many tasks in their day. Let us give you knowledge, knowledge of the many different trunk organizers that we think you will certainly love! It is no surprise, after reviewing the Trunkcratepro, we rate this as our number one pick! This organizer is designed eco-friendly and made with heavy-duty, quality oxford polyester fabric. This is a strong organizer and it is strength shows even when it is empty. It comes with 4 compartments and 2 removable sub-dividers for optimal customization. It comes with two straps and secures perfectly in trucks, cars, vans and any vehicle that needs to be organized! We love the customization of this organizer. Four large compartments, eleven pockets in total; 2 expandable, 8 fabric pockets, and 1 mesh pocket. This also includes 2 removable dividers to allow for different size items and needs. Open size: 23.5 inches x 12 inches, ideal for everyone from the business professional carrying important presentations and binders to the busy parent who needs strong organization and portable in and out of the car when needed! Non-slip, strong handles with grips make for easy carrying of items in and out of your car, when you want to bring the whole thing in or out. We like the non-skid bottom to prevent your cargo from sliding around in your travels. There's nothing worse that the sickening crash of that extra-large jar of pickles when you make a fast turn or emergency stop in the way home from the grocery store! This organizer is built tough! Heavy duty quality Oxford fabric, strong durable ring holes that allows for easy attachment to the back of most SUVs and trucks. Solid precise stitching. We really like the hard structured base on this organizer, very strong and nothing flimsy about this, even when it is empty. Great value and an even greater cost! 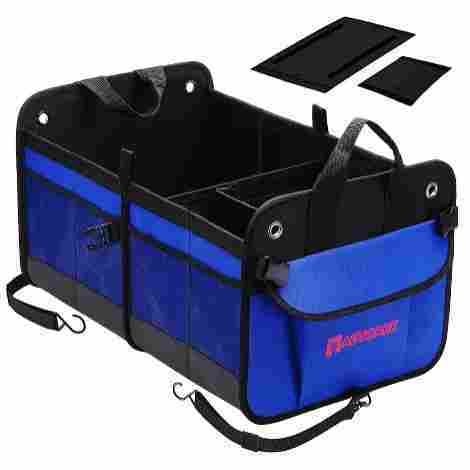 Coming in at number 2 is the Picnic at Ascot Trunk Organizer with Cooler. This heavy-duty trunk organizer is perfect for SUV's, trucks, and minivans. Made with high-denier canvas and reinforced with waterproof backing, it includes 3 dividers to customize your compartments and will definitely be useful when packing your groceries. The cooler is versatile and is great for those frozen items that need to travel on those warm sunny days. Speaking of sunny days, we can’t imagine how wonderful this organizer would be to haul your fun in the sun items to the beach. Excellent organizational quality for the family on the go! We like the removable hot and cold insulated compartment. For the family that enjoys road trips, or traveling during the holidays, the cooler keeps cold drinks cold and hot dishes hot. Leak-proof and puncture resistant makes for easy traveling with no mess! Customize these compartments with Velcro adjustable dividers for carrying canned goods, fruits, vegetable, cold foods, etc. If you live a 21st century, on-the-go kind of life, you need one of these! 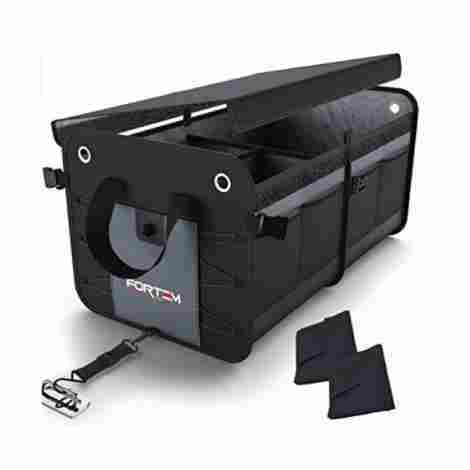 Folds nicely for easy storage, carrying, or storage in the garage. Open Size 30 inches x 14.75 inches x 9 inches. 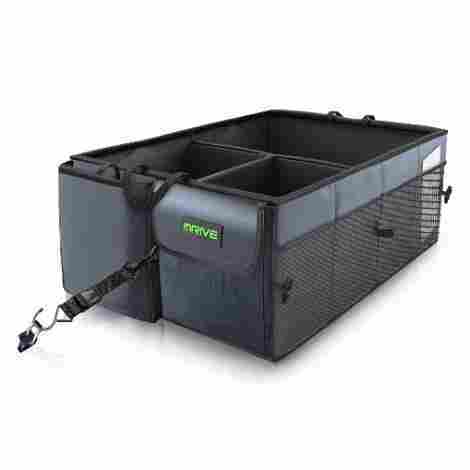 This is a really nice trunk organizer with cooler, well manufactured and durable. Everything could want in an organizer and more. It is a little more expensive than most on our list – which is why it landed in 2nd place and not on the top! Excellent cost and value! Kudos! 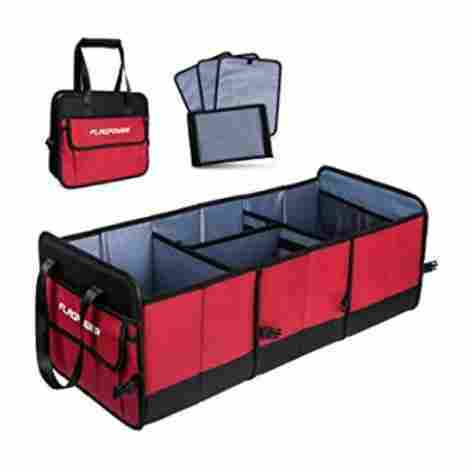 Rounding out our top three is the Drive Auto Trunk Storage Organizer with straps. We are loving the organization power with this product offers. This unit is versatile and customizable for every driver’s needs. This organizer can collapse to a smaller size for the passenger seat, backseat or rear cargo area. We love the large pockets for easy accessibility (water bottles, coffee thermos). Solid rigid panels, nice base, 8 flexible mesh pockets, and folding compartments for tablets, folders, phones and more! We love the ease of the tie-down strap system prevents this storage organizer from taking a spill when you take a corner to sharp. Protecting your valuables from rolling around in your trunk will be no more when you install the adjustable length straps. It can even be used around the backrest of your seats or attached to the child safety anchors. The Drive Auto Products entry features nice quality Oxford fabric, very rugged panels and is built well. It's strong enough to store those heavy items. With strong mesh pockets and solid fold up compartment panels, including metal hooks (no plastic here), we really like this trunk organizer. Keep your car clutter free and organized with this great product! Tie down straps prevent this organizer from rolling around in the backseat or trunk of your car. It uses adjustable straps to hook, sort of like a cargo net. It can be secured in the front seat, back seat or trunk. Locking it down in the back seat keeps things from flying around the passenger compartment when you least expect them! This organizer has a lot to offer for the cost. 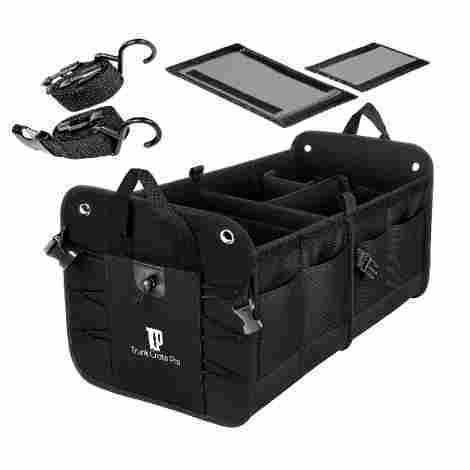 Manufactured well, this trunk organizer is a great product for the money! That's our goal here always, finding the best for you to help you stretch your hard-earned money! We at DrivrZone really enjoyed reviewing the Knodel. It is constructed of high-quality oxford fabric, water-resistant surface with a nice foldable cover to keep your cargo safe and out of sight if need be. Excellent organizer to keep your car uncluttered and organized. It’s large enough for groceries, sports equipment, tools, office supplies and just about anything you can imagine. No worries of crushed items as the dividers are made sturdy to ensure no collapsing or bending. This organizer is designed for multi-purpose use and has a nice non-skid bottom to assure your cargo remains in the organizer and not rolling around the trunk of your car. Customize your organizer with removable dividers, 4 mesh pockets for anything that you wanting to access quickly. 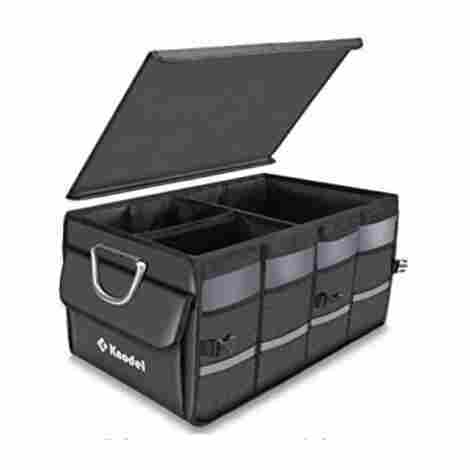 We definitely like how easy the Knodel Sturdy Trunk organizer is to install. Also folds up easily for simple storage. 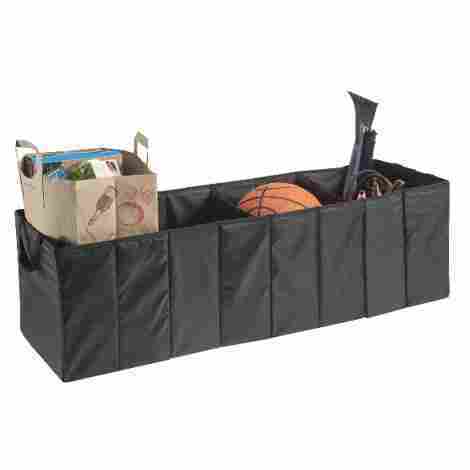 Lightweight eco-friendly, makes this organizer perfect to take to the market to grocery shop. Wipes clean easily with warm damp cloth. This product is made with strong unbreakable metal handles, making this a perfect organizer if you are hauling heavy cargo in and out of your vehicle. Dimensions are 23.2 inches x 13.5 inches x 12 inches, good and roomy for that collection of random essentials piled in your trunk. Large storage capacity, water-resistance, and extra durability make this perfect for the busy family on the go! If need be, you can store up to 25lbs on top of the fold-over lid. Nice storage all around! Well manufactured trunk organizer, visually really pretty. It is also made with a reflective stripe for safety purposes when you have your trunk open or are carrying it to the office or home at night. Sliding into number five is the nice AUTOMARK. Constructed with premium Oxford fabric, this large and sturdy organizer will certainly provide you with years of use, and resistance to wear and tear. Heavy-duty handles with 4 heavy-duty metal eyelets with 2 strong handles for easy storage and carrying (can hold 80lbs worth of cargo). It has twelve (12!) pockets with 2 buckles for closing for easy folding and storing. This organizer also has a removable 3-layer water-proof bottom for extra stability. The bottom has non-skid strips as well as rubber feet to keep your cargo safe and not spill and roll around during travel. Fits all vehicles and locks securely in the trunk of your car. Carry your cargo with more organization - groceries, soccer equipment, school books, tools, or office files – this organizer can hold it all! This organizer boasts small, medium and large pockets, twelve in total. Two expandable pockets, eight mesh pockets, one large PVC mesh pocket, and one large polyester pocket to allow for extra storage and easy accessibility. Removable sub-dividers for complete customization. Dimensions are 22.8 inches x 14.6 inches x 12.6 inches. Most of our organizers come in black, but this organizer comes in three different color options; blue, red, and black. It's a known psychological fact that bright colors will lift your spirits, so maybe a red one is what you need to keep you moving on dreary winter days! The price is as expected, and a good value. The multi-purpose design has strong middle snaps to allow for use of half unit at a time making it perfect to place in the front seat if need be. Easy to use, easy to install and easy to wash with a warm damp cloth. This product from Fortem comes in on our list at number six. This is a nice quality manufactured organizer, which includes three large compartments with strong structured sidewalls and baseplates. We really like this heavy-duty collapsible storage unit for all your cargo needs. Three large sections, 1 sturdy divider, four sturdy mesh pockets and two pockets with lids allowing optimal organization for your car. This product has a nice foldable top lid so that you can store items on top of it, or keep it closed and secure to deter from mischievous theft. Say it isn’t so? It’s true, this trunk organizer comes with two bonus microfiber towels for your children’s spills. This trunk organizer's base is made solid and strong. Constructed with high-quality nylon fabric with sturdy sidewalls and baseplates. Nice strong handles to make carrying in and out of your vehicle easy. Quality made, visually really nice to look at. It is a little more costly, which is why it’s a little lower on our list – but a quality buy nonetheless! Coming in at number seven is the MIU Color. We really like this large capacity trunk organizer and our favorite feature is the two aluminum handles for easy carrying to and from your vehicle. This organizer has large sturdy compartments, more storage for your needs. Comes with removable strong divider to allow for two, three or four compartments. The eight tall mesh pockets are perfect for easy accessibility. The sturdy rigid base with a hauling capacity of 100lbs makes this perfect for the driver who needs to carry their cargo in and out of their vehicles. This product is water resistant and can be cleaned with a damp cloth. We also like the hard foldable lid that can be accessed from either side. Also included a non-skid base so your cargo stays safe with no flipping or rolling around in your trunk while you are traveling. This organizer can be folded and secured as a half-trunk organizer, making it perfect for the front seat for the busy mom running errands, or the business professionals that use their vehicle as an office. There are premium aluminum alloy handles for your comfort when hauling cargo to and from your vehicle. The dimensions are 25 inches x 17.5 inches x 13 inches, a nice fit for most vehicles. 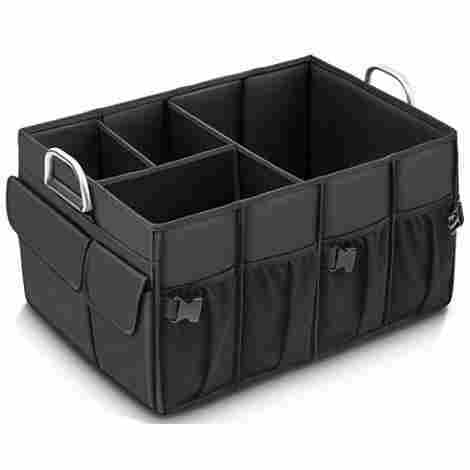 We really like this larger capacity organizer, although it is a little more expensive. Landing in our number eight position is the Flagpower. When reviewing this product, a few things stood out to us that we wanted to share, and why this made our list. It is a nice size, not too small and not too large. It’s made from strong durable oxford fabric and thick PVC mesh. Heavy duty construction and a rigid base, allowing for 100lb capacity with the strong solid carrying handles. 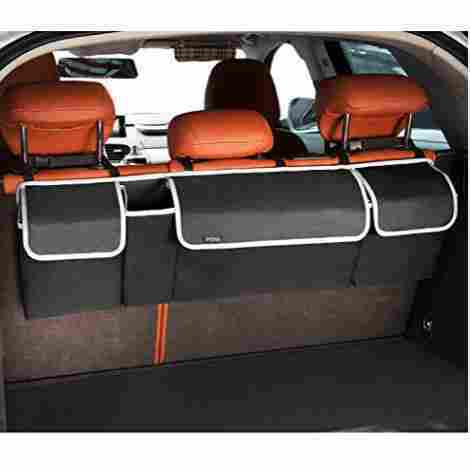 This organizer has rubberized bottom strips for non-skid and non-slipping in the trunk, allowing for your cargo to remain in the compartments and not rolling around the trunk of your car. The middle snaps allow for multiple compartment sizes, and the collapsible design allows for easy space-saving storage. This organizer boasts 3 large compartments with strong, solid sub-dividers. Sturdy rubberized bottom supports to prevent your cargo from tipping over, keeping your items safe and organized in your trunk organized. The overall size is 29.6 inches x 12.7 inches x 11.1 inches. We really like the middle snaps to size the organizer smaller (half-size) for those who need to keep organized in the front seat or the trunk of compact cars. Heavy duty carrying handles allow for easy carrying in and out of cars, perfect for file folders, professional papers, etc. This product has been tested to carry up to 90lbs. This large capacity product is perfect for the large family that needs plenty of storage for sports equipment, groceries, or just about anything you can imagine. For the cost, we think the value of this organizer is great! Here is our number nine pick, the High Road. This is a great all-around product that fits both SUVs and compact cars. It has a slim sleek profile with taller height than most which mean more storage yet takes up less room in your trunk, allowing for groceries, sporting equipment, pet supplies, lawn chairs, and baby strollers! Can be folded for customization, allowing you to use one, two, three or 4 compartments, sturdy side panels. Water resistant for easy cleaning. Foldable for easy storage when not in use. We really like the slim profile build with tall structured sides. This organizer is constructed with a mid-grade polyester, allowing for it to be lightweight and can be easily cleaned with a warm damp cloth. Folds down flat for easy storage. These well-structured compartments are expandable for individual driver’s needs. Designed to be used for 1-4 compartments for all your cargo needs. 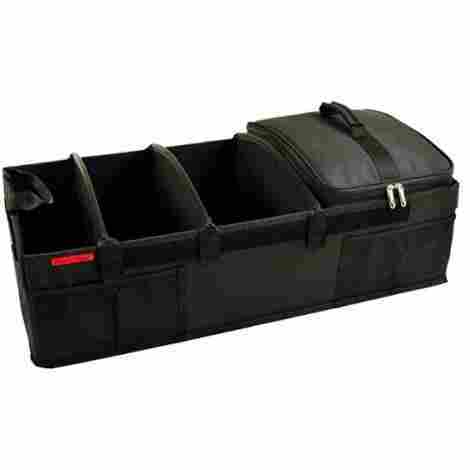 Take the high road with this big 40 inches x 12 inches x 12 inches trunk organizer. This is a great simple organizer that serves all purposes for less money. We always favor spending less money! Nice slim design allows to you buy two for those who need additional organization in their trunks. We really like this product, and are sure you will too! Rounding out our top 10 is the Pido Backseat Trunk Organizer. We like this for a number of reasons, but mostly because it offers our readers something a little more unique than the traditional trunk organizers. This is a wonderful hanging alternative that attaches to the backseat of your vehicle with adjustable straps, allowing for a nice solid fit. On the back of this organizer is a durable Velcro strip that adheres to your seat linings. This organizer is made with durable fabric and reinforced stitching and thick foam padding to prevent sagging. It has 4 spacious compartments with two inner lids for smaller items. Also comes with flip-up lids to conceal your important cargo. Keeping everything off the floor and organized allows for more room and storage for your larger items (baby strollers, large grocery bags, banquet tables, large sporting equipment, and maybe even your dog)! Made with durable strong fabric and thick foam padding to reinforce compartments which prevent sagging. Durable adjustable straps for hanging this organizer on the backseat of your vehicle, allowing for additional storage space and keeping your vehicle less clutter and more organized. Although this organizer is a bit small, it has a lot to offer for the families who really rely on their trunk space for organization and still be able to carry sports equipment, baby strollers, and large grocery bags. We feel this is a great quality made organizer for the cost which is why it made our top 10 list. With thousands of trunk organizers on the market today, how did we choose our top 10? It was definitely a challenge, but we are confident with our choices and what we believe to be… the best of the best! We took into consideration material, quality manufacture, size, features, and cost. More bang for your buck, because we all know an educated consumer is a happy consumer. So, let’s take a look below to see how our decisions were made and how we arrived at our Top 10 Trunk Organizers! When reviewing these trunk organizers, we needed to choose quality-built models that will withstand the wear and tear that may be placed on them. The reason for purchasing an organizer is to do just that – be organized. If a failing product that rips and tears or rolls around in your trunk defeats the purpose of what you are trying to do in the first place, stay organized, buy one from our list. Most of the organizers that we have reviewed and rated here at DrivrZone are made with tough Oxford fabric, polyester, and vinyl. We looked for precise stitching and reinforced corners, so tears do not happen. If mesh pockets are included, most are made from strong PVC material and many have durable Velcro or rubber strips on the bottom allowing for a non-skid feature to ensure your cargo remains safe and secure, without tipping over and making for a very cluttered mess. More expensive organizers come with waterproof or water-resistant materials and features. Knowing the difference is easy and will help you when choosing the perfect organizer for your needs. Waterproof usually means that products can be submerged in water. Not that you would want to submerge your trunk organizer, but if they are surrounded by water (such as a cooler), it will not ruin the material. Water-resistant can withstand raindrops, and will not leave marks, which means you can wash your organizer with a warm damp cloth. All of our trunk organizers in our top 10 list include handles for carrying to and from your vehicles. Some drivers will carry their organizers in and out of their vehicles every day, and some drivers will use their organizers as a permanent feature in their trunk. Handles are very important to some, and maybe not so important to others. For the business professional that tends to use their organizer as an office while hauling his important cargo from car to office daily, we recommend a nice ergo-friendly handle, such as the lightweight aluminum handles. For the family on the go, where their organizer always stays put in their vehicle, we recommend a nice quality-built trunk organizer with vinyl straps. If your resolution this year is to be more organized, and you are here at DrivrZone, than the trunk of your car is a great place to start! Trunk organizers are fairly inexpensive. Our list has been reviewed and rate for not only quality, but for cost and value as well. For obvious reasons, the larger organizers that comes with customizable compartment features, additional pockets, including some with coolers – come with a higher price. Knowing what you will need your organizer for, and the cargo you are putting in it, along with whether you will be hauling in and out of your vehicle will all need to be considered before you can make a sound purchase. We certainly hope we were able to give you as much information as we could, giving you the knowledge that we know you need to get online and purchase that trunk organizer today! Q: Are these universal to fit all vehicles? A: No, not quite. However, the trunk organizers that we reviewed today fit most vehicles. While the small organizers are perfect for the driver who needs their cargo in the front seat for easy access, larger trunk organizers are great for families on the go that like to store their belongings in the trunk. Be sure to check the length and width of your trunk vehicle before shopping to make sure you buy the perfect trunk organizer for your vehicle. Q: Can these be customizable? A: Most of the trunk organizers we reviewed can be customizable. Many come with removable sub-dividers, and most have clips and/or snaps that allow for you to make the compartments different sizes for your many needs. Everyone’s needs are a little different, these trunk organizers are a breeze to shape to your needs. Q: Will they slide around in the trunk of my car? A: Trunk organizers are made to keep your cargo in its place, and not to be rolling around in your trunk while in you are driving. As you should always be cautious while driving, the normal left and right turns that you make with your vehicle should be fine. Keep in mind, there are some great organizers that we reviewed here at DrivrZone today that have rubber-strips and Velcro non-skid features. Q: What if I need to carry it from my car to office daily? A: Most organizers do come with adequate carrying handles. If your trunk organizer is something that you will haul in and out of your vehicle often, then we recommend that you buy an organizer with very sturdy handles, more ergonomically. There are some great carrying trunk organizers on the market, including a few with aluminum handles for a strong grip with heavy cargo. A: The weight limit will vary depending on the quality of the organizer. On average, most can carry between 50-100lbs. That’s a lot of groceries, sporting equipment, school books, pet supplies and more! If you will be using your trunk organizer for heavy cargo, we recommend that you pay close attention to the weight limits before purchasing. Q: What if I don’t need it every day, where can I store it? A: Most trunk organizers are collapsible and can be placed neatly beneath a seat, backseat pocket or laying flat in the trunk. Some with a hard foldable lid will be a little larger but will collapse as well. Not only can they keep you organized, but hey will stay out of the way when you need your entire cargo area. Q: Are these all waterproof? A: Unfortunately, they do not all come waterproof. While most of these organizers do come water-resistant (meaning they can be wiped with a damp cloth for easy cleaning), you will have to read carefully which ones are waterproof specific. Some do come with waterproof coolers for drinks and ice and can also be used for transporting hot dishes – perfect for holiday travels! Q: I am a busy mom with toddlers, are there any that will fit in my SUV trunk with a stroller or small bicycles? A: There are so many great organizers on the market today, we are confident you will find one that fits your needs. We really like the hanging organizers that sit up off the floor of your vehicle which allows for stroller storage and or bicycles, or just about anything you can imagine.